Watch Yochay Kiriaty, Windows 7 Technical Evangelist, and Taskbar product team members Chaitanya Sareen, Trish Miner, Stephan Hoefnagels as we present the new Windows 7 Taskbar functionality and motivations. 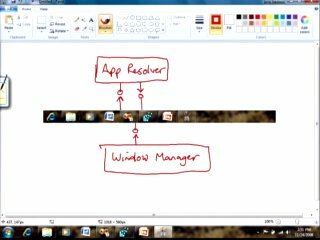 This video shows what is new in the Windows 7 desktop and taskbar, and the common user tasks and scenarios we are simplifying. 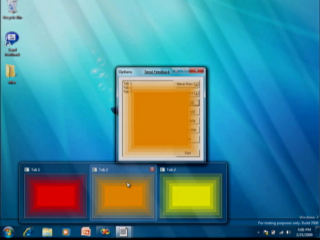 For more technical information on the Windows 7 Taskbar, read the Windows 7 Taskbar Part 1 – The Basics post. 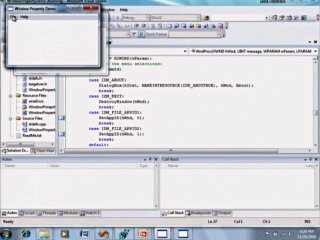 For more technical content on Windows 7, along with a few cool code samples, go to the The Windows 7 Blog for Developers. the new taskbar and win7 in general is pretty awsome i gotta say..
a grouping feature cold also have been used for tab groups in ie..
what im saying i guess is that it whould be cool if windows that are collapsed together in the taskbar could be grouped further in an app specific way is that possible somehow? Great video and very nice to see these new features. ps. It's funny to see a group of people without any 'TV' experience. To answer you last question, yes. 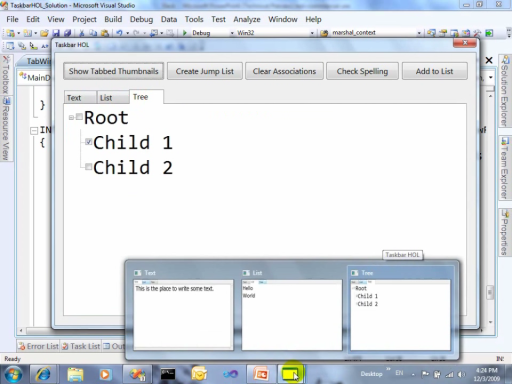 You can control the way you group different windows in to one glom or several gloms. 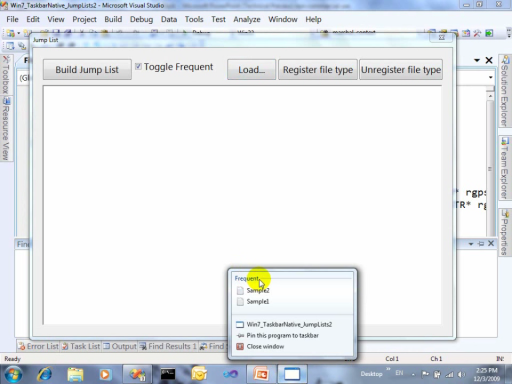 Watch the Jump in to Windows 7 Taskbar Jump Lists for more information and examples. you wouldnt happen to know if the ie team are thinking about giving users more control over the gloms? About the drag/dropping of icons in notification areas.. what if I want an icon to show up only when it has a certain appearance? For instance, on my Vista laptop right now, I have the LAN icon set to hidden except when there is an actual connection. Likewise, I'd like to set up the WHS Connector icon to only show up when my network is critical (and the icon is red). 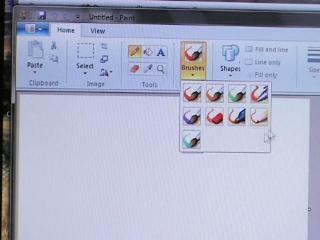 I can do that in Vista right now, because it allows you to show/hide stuff based on the appearance of the icon. How would I do that in 7? It's very nice to see that the user can now arrange taskbar buttons by dragging them around. 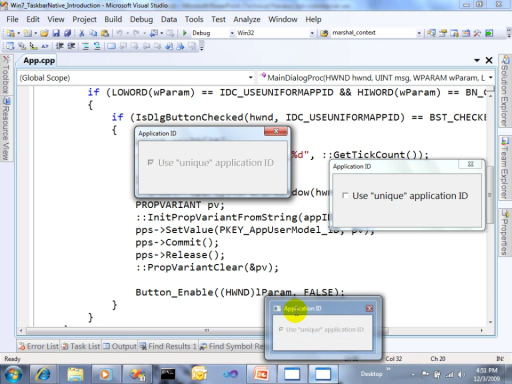 I REALLY hope that the same will be true for the popup preview windows that display the application's various windows. This is because it allows the user to arrange the internal order of windows inside the popup thereby saving time when using the same windows to type different things in. You may have different powershell instances launched but the first one is pointed at c: and the second one is pointed at c:\program files\. If you, the third one pointed at something else. By allowing the user to control the order of the 'preview' windows inside the popup, you save time when trying to do repetitive tasks that require frequent window switching... User in control! Personally, I like Windows 7. It screams on an older machine I have so I do think Microsoft has gotten it right. Will I use it outside of beta? Probably not. what do i have to do to report bugs in win7? i cant seem to find a connect page and the "send feedback" links say i dont have premission to post in the connect forums :/ is there an invitation code im missing? i got my beta key from msdn..
the bugs ive found are mostly in the shell but still, they are a bit annoying.. nothing major though. does anyone know why the icons such as library and homegroup appear in the folder desktop in explorer but not on the actual desktop? at least i think thats a bug.. if not, its very confusing also, if you delete the library from the desktop folder in explorer, then right click on your username in the start menu (took a while for me to figure out that that was actually the library and not the "user folder" now, also confusing i might add) and add it back, it does appear on the desktop and in the desktop folder in explorer..
personally i think 7 is great with peek and the start search combined with all the techy stuff like readyboost and kernel improvment it completly pwns xp imo..
the pref/memory improvment and peek are cause for an upgrade from vista as well i think but perhaps not as urgently.. if i wasnt such a geek that i have to use the latest stuff when ever possible, pricing would definitly be a deal tipper..
Isnt this just Mac OS X all over again? This actually goes for a lot of Vista/win7 features ... Search (Spotlight), Gadgets (Widgets), Chess, Calendar ... and now the taskbar (mac os dock). I miss some innovation here! 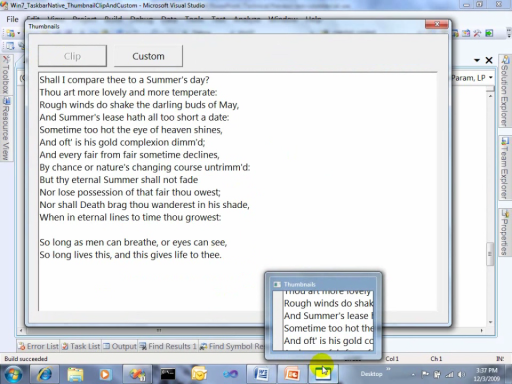 sorry dude but you need to check your research apple will claim they invented everything from touch to fire to the wheel, but it just aint so..
i cant really speak for widgets but win7 doesnt even include a calander app so i dont know what you mean there..
as for the taskbar.. check out the pdc talk. there they show windows 2.1 that actually had a taskbar nearly identical to the one in 7. and that was several years before the dock. so if anything microsoft is stealing the taskbar from win 2.1 not from osx. imo aero peek is pretty inovative. its such a simple idea but its darn useful. as are the tab groups in explorer, you dont see that in any other browser..
At least if you are going to compare it to OS/x make sure you get it in order who borrowed what from whom. Spotlight was borrowed from desktop search. Gadgets oh have been around since OS/2 days. way before konfabulator etc were even thought of. and came to windows first. (desktop x stardock) Calendar I'll give you ya. games I don't count as they typically are removed from business installs anyway. 1. Why are the Notification area icons still so small, it is very difficult to tell them apart and see what they are? 2. If you click on an app icon that is not running or has one instance, the windows maximizes, if you click again, it minimizes. That's good. Why is the behaviour radically different when there are 2 or more instances of an app running: you can no longer minimize any window and clicking does nothing else but bring up the quick preview button. Why doesn't click just open for example the most recently used window instance of that program, and clicking again would minimize that or all windows in that program group? To me, that would be a much, much better usability. 3. I find the Start menu has a lot of redundances and unnecessary noise. Why are there so many, many links in right hand pane that all lead to almost the same Library place in Windows Explorer. Why not just eliminate the all and replace them with one large button labled "Libraries". Simple, effective, easy. Why are there 2 places to pin icons, start menu and task bar? I find it confusing and inconsistent, since your most important apps should now be on the Taskbar. 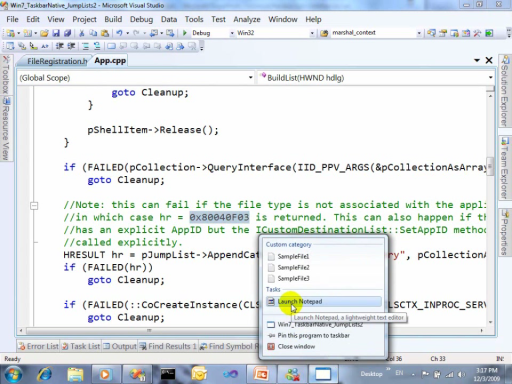 Why not eliminate that stupid "All Programs" link, and instead directly just show all programs? Fewer clicks = happier users. 4. The replacement for the mini taskbar media player has missing functionality, functionality I use a lot: no skimming, no volume control. 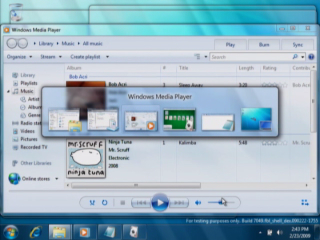 So sorry, I am not getting this new Windows 7 Taskbar in its current form. I find it akward and requireing a lot more clicks and moving the mouse around than the current Taskbar. 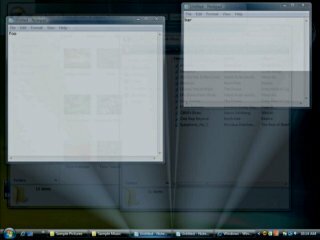 I love Win7 for its technical accomplishments, however I prefer the Vista task/start bar. I hope i'll be able to config it back down somehow without having it revert to a win98 look. 1) Way too many clicks to do anything. Currently I only need a single click to switch to my application. Are you telling me that I'm going to have to hover over the taskbar button, hover over the instance/tab and then finally click the button to actually switch? And this is supposed to make it "easier"? 2) That taskbar is way too big / thick. 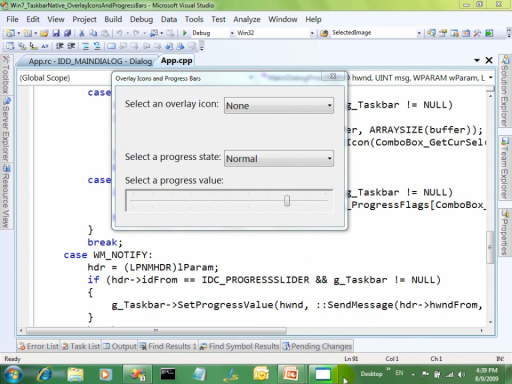 Not only will we have huge applications bars thanks to the ribbon, but now the taskbar is twice as thick as well. I bought a higher resolution monitor to have more room, not so that you guys can fill it up. 3) The whole this "icon is both for running and closed application instances" I'll have to see if I can get used to. 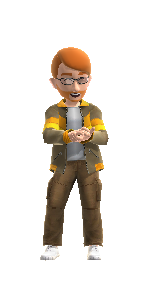 4) Where are the needed customizations? What if don't want those icons to be so huge? (my eyes are quite fine thank you very much) What if I want to drag one IE window to one monitor and another instance to another? Will it separate the two? Please tell me you will finally have proper multi-monitor support! I say you guys go back to the drawing board and a little less BS (i.e. marketing talk) would help as well. This is C9 after all. Thanks. Can you change where the start button is when the start bar is docked someplace other than the bottom. I'd like to have the start bar on the left, but still have the start button in the lower left of the screen instead of the upper left. Otherwise it looks great and I'm looking forward to playing around with it.